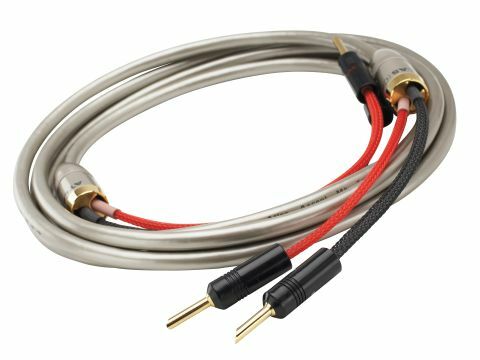 There are, of course, speaker cables that cost a good deal more than Ascent 2.0, but £460 for a terminated 3m set of speaker wires is definitely not mass-market stuff. In fact, it represents the top of the Atlas range. It's possible to buy this cable unterminated and arguably that's better value, but those metal terminators do make for a very neat job and add to the cable's high-end look. Fear not, though: there are no electrical networks in there! Atlas uses high purity conductors of 'Ohno Continuous Cast' copper, with insulation materials including PTFE and cotton yarn, and the overall construction is flexible for an 8mm cable. The 2.0 in the name refers to the copper cross-sectional area in square mm. Although the fitted plugs don't look as fancy as some terminators, they do give very good contact in sockets. Atlas supplies this cable with a complimentary 'burn-in and demagnetising' CD, which is a nice touch and allows sceptics the chance to try it without admitting anything. We were at first a little taken aback with the sound, which seemed to be bass-light compared with the sort of performance one expects at this price. After a little while, though, we came to realise that the bass is in fact exceptionally well-controlled and as a result highly detailed, precise and, yes, extended at the instants when it needs to be. This may not be to everyone's taste - you may prefer a richer overall balance - but it's well worth sampling. What's more, midrange and treble are very open and detailed, and imaging is first-rate and exceptionally stable. Not your average cable, but welcome for just that reason.